We recently came across some marvelous work from Alexander James International (AJI), an interior design firm in the UK that specializes in the Hotel & Leisure market. 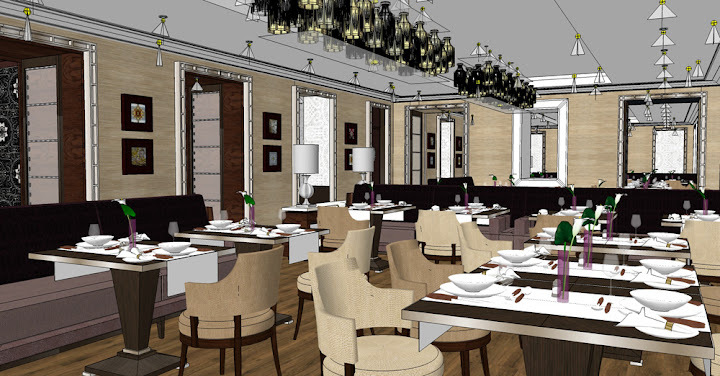 Michael Reekie, Senior Interior Designer for AJI, was good enough to provide some insight into how they use SketchUp Pro. I started using SketchUp Pro about five years ago. At that time we considered it a tool to help produce quick 3D line drawings of small areas. Gradually, its value has become more apparent and with the recent addition of Shaderlight, it is now considered to be an invaluable tool by the whole design team. At the earliest stages of the design concept, I import a CAD plan of the project into SketchUp from which I build a model. It gives us a three dimensional awareness and makes space planning both easier and more accurate. I continue to use SketchUp Pro throughout the design process, periodically using a fast, low resolution Shaderlight render to check the progress of lighting levels, features, furniture, and finishes. When I am sure that no other changes are necessary I produce a high resolution rendering which is imported into Photoshop. I can then make any small changes to colours or light levels and add people or anything else that I feel would enhance the final visual. Before using SketchUp I produced hand-rendered visuals. The uncomplicated nature of the program has made the transition easy and very effective. 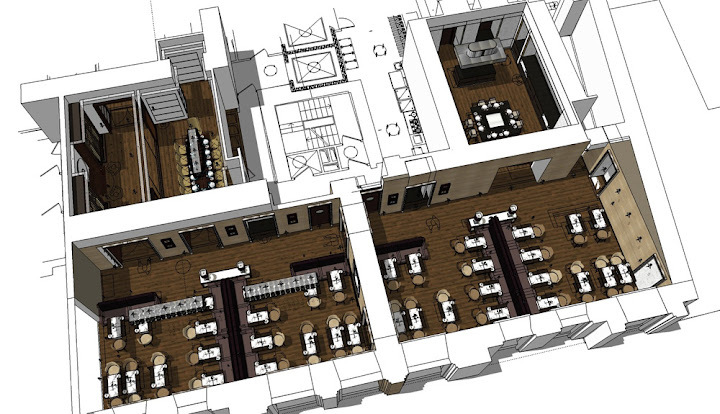 SketchUp has become an invaluable tool for the whole design team. A big thanks to Michael Reekie and the whole AJI team for providing this snapshot into their SketchUp workflow. Great work! Chris joined the SketchUp team in its infancy with @Last Software and has found ways to use SketchUp for just about anything. It's also important to note that he thoroughly enjoys scones, coffee, and the Colorado outdoors.